The perfect gift for your very own superhero, this beautiful hallmarked Sterling Silver Plectrum can be engraved for free and personalised to your requirements. Gifts of Distinction is now offering free engraving across the whole product range. The Solid Sterling Silver Plectrum is handmade by our silversmith here in Birmingham's prestigious Jewellery Quarter and engraved with the classic Superman symbol. Each Sterling Silver Plectrum comes packaged in a lift off lid presentation box, making it an ideal gift for any budding musician and next big thing! To make this an extra special plectrum, why not take advantage the free silver plectrum engraving service, the engraving service we offer on this great Sterling Silver Plectrum can be added during the ordering process. 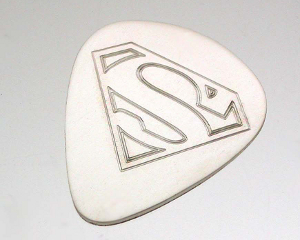 The Personalised Silver Superman Plectrum is handmade to order, and is engraved and dispatched in one day. Each silver gift is unique and be personalised to your requirements.